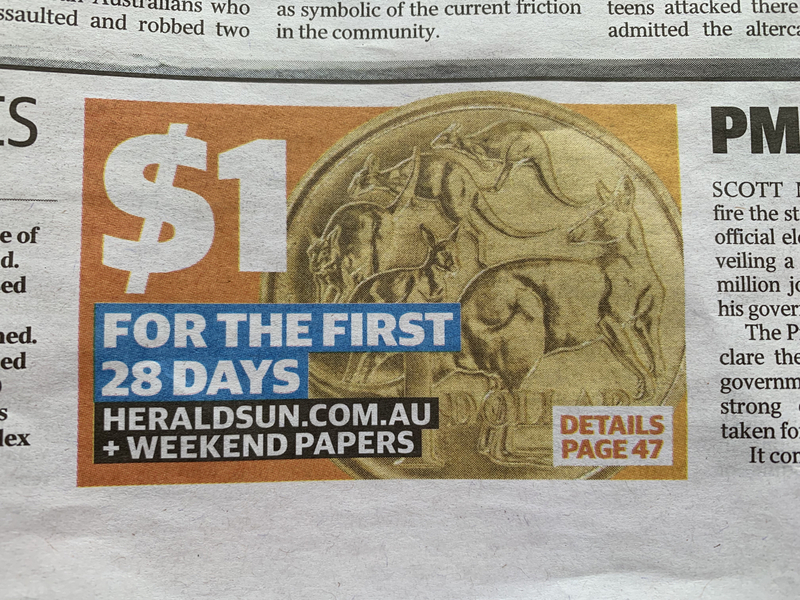 The front page pitch on the Herald Sun is compelling. $1 for 28 days of weekend delivery and digital access. It is a price that indicates how the publisher views the future of their product. One of my stores serves retirement village customers who like deals like this. It is interesting seeing this front page pitch in the same week we are asked by a newspaper rep to provide a better location in-store for promoting their product. With their now constant promotion to our customers to ditch retail for home delivery, the requested move will not happen. You had a newspaper rep instore ? 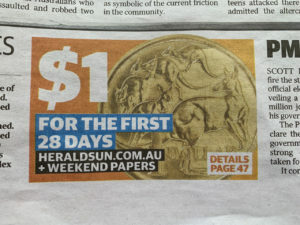 What about the $1 an issue on Woman’s Day and Who magazine’s. Its all proof that there is further margin in the product for newsagents that we are not getting. I don’t care for the excuses that these are declining products. Newsagency associations and marketing groups have all failed to achieve better margins on both magazines and newspapers. Amanda, I can only speak for the newsXpress marketing group. You are wrong. For years, it has had commercial relation ships with some publishers that have facilitated financial benefit for members, such as successive years of no membership fee increase while, at the same time, increasing service to members. That is bottom line benefit for those businesses. So are you saying as a newsXpress member you get more than 25% commission on magazines? newsXpress members get more than the standard Retail commission rate on the selling of newspapers? Amanda, as with supermarkets, financial benefits can flow in more ways than merely commission. newsXpress members have financially benefited from this. It is one thing to sit at the sidelines and demand others do this or that for you and another entirely to actively engage and support this happening. Newspapers in hard copy form are falling in circulation, and therefore in advertising revenue. To give newsagents more than they have before publishers would be crazy it would just increase the demise. Going back to the supplier for more is yesterday’s Unionist hand out. Markets are out there, use it to create them, if, unfortunately it can’t be done, shut them down for it’s over. I made the comment that no extra margin has been achieved. Amanda, as supermarket bean counters will tell you, margin can come in multiple forms.